Shelton’s political connections provided for the best available defense attorney, Nathan Dryden, the first prosecutor to secure the conviction of white man for the murder of a black man. He was also a morphine addict. Such is the stuff the blues were made of. Dryden argued his way to a hung jury for Shelton, but died before his second trial. As witness stories changed it became increasingly unclear whether Shelton killed Lyons out of self-defense. Eventually, Shelton would be convicted and did time in prison before a Democrat governor commuted his sentence. The musical interludes are entertaining and informative, as when they illustrate Ma Rainey’s “Stack O’Lee Blues,” which conflates Stagger Lee and “Frankie and Johnny.” It was a natural fit since “Only five years later and about a dozen blocks away from where Lee Shelton shot Billy Lyons, Frankie Baker finally decided that her man, Allen “Albert” Britt . . . had done her wrong.” (p. 85) Incidentally “Duncan and Brady” are also cleverly worked into the narrative. Hendrix’s art, almost entirely black and white line drawing, conveys an effective film noir atmosphere, which serves the story well. 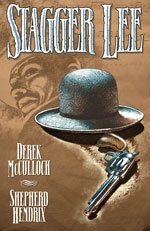 Stagger Lee is a thoughtful graphic novel deeply steeped in the blues, which should also appeal to readers of period crime fiction like the Alienist. It also has contemporary resonance, as it depicts the corrupt workings of the nascent St. Louis Democrat machine, led by “Colonel” Ed Butler, particularly relevant in light of recent political corruption cases from the St. Louis/East St. Louis area. Party enforcer Kelvin Ellis could argue his conviction for vote buying and indictment for conspiring to kill a federal witness simply follows in the tradition of Stagger Lee. Stagger Lee remains the archetype of the “bad man” of blues legend. McCulloch & Hendrix's excellent Stagger Lee paints as complete a portrait possible of the man, without ruining the aura of mystery which surrounds his legend.